For the past week or so, evangelical sites have been critiquing John MacArthur’s Strange Fire conference, which condemns “the Charismatic Movement” as a tradition that performs false worship practices. Featuring, in addition to himself, messages by Joni Eareckson Tada and R. C. Sproul, along with a number of lesser known associates of MacArthur, this conference anticipates the November 12 release of a book by the same title (pre-order the hardback here). One of MacArthur’s stated purposes was to “start a conversation” about the errors, extremes and dangers of the movement as a whole; judging from the reaction, I’d say he started something more akin to a cyber-riot. But MacArthur probably isn’t surprised. He’s been the provocateur of tremendous controversy before, over the relationship between the Lordship of Christ and the freeness of God’s grace in salvation, back in the 1980’s, centering around his book, The Gospel According to Jesus. In both cases, I think it is fair to say that the intensity of the reaction is partly due to ways in which MacArthur’s message misses the mark, and opens himself up, as one Cessationist reviewer put it, to easy refutation due to his failure to draw careful distinctions between the various movements–in this case, within the Pentecostal tradition and the Charismatic Renewal, Word of Faith Movement, the Brownsville Revival, New Apostolic Reformation, and any number of other varieties which feature distinctive forms of the so-called “charismata,” or purportedly supernatural manifestations of the power of the Holy Spirit. In addition to his denial of the legitimacy of the focus on the miraculous in this multi-faceted tradition, the Strange Fire Conference also intends to focus on ways in which the movement in general promotes false forms of worship, as the conference name implies, being an allusion to the account of the deaths of Aaron’s sons, Nadab and Abihu, in Leviticus 10:1-3 upon their offering of “unauthorized” (ESV), or “strange” (KJV), fire in their censers, in direct violation of God’s explicit and detailed prescription for Israelite worship. 3 Then Moses said to Aaron, “This is what the LORD has said: ‘Among those who are near me I will be sanctified, and before all the people I will be glorified. '” And Aaron held his peace. Fair or not, MacArthur and his fellow conference speakers would all advocate worship derived solely from the clear teaching of Scripture, a distinctive of Reformed theology known as the Regulative Principle of Worship. Undoubtedly, MacArthur, et al desire to see them come into closer conformity to Scriptural modes of worship, in essence calling the movement as a whole to Reformation as the Calvinistic Reformed tradition understands it. Now it is possible for us not only to read, watch and hear what critics of the Strange Fire Conference have to say, we can all, friend or foe, see for ourselves how the messages of the conference were presented. Audio files of the have now been released, and are available for free download, with video and transcripts of each session forth-coming. Judge for yourself whether MacArthur’s charges against so-called Continuationism (the view that New Testament sign gifts are ongoing today) and his distinctive case for Cessationism (the view that these came to an end with the close of both the Apostolic era and the canon of Scripture–with which I agree) are legitimate, and where he misses the mark. 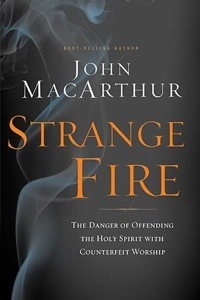 Visit Grace To You’s blog post, “John MacArthur on Making an Informed Response to Strange Fire” to watch a short introductory video and to download the audio files for each session of the conference which has set the evangelical blogosphere ablaze, in my view, both rightly and wrongly. I think it would be fairly difficult to try to carefully draw a distinction of all the different types of “charismatic” fellowships. Your list of movements, “the Pentecostal tradition and the Charismatic Renewal, Word of Faith Movement, the Brownsville Revival, New Apostolic Reformation” could also include “Vineyard, Reformed Charismatic, Sovereign Grace, Acts 29, Drisocoll-ites (Mars Hill type),” and that’s just a few more. My point is the difficulty of being specific is burdened by the scope and variety of the charismatic movement(s). If he would have tried to parse the various movements, the conference would have been about a month long. I think the discussion of the normative principle vs. the regulative principle is where to start (for a conference).